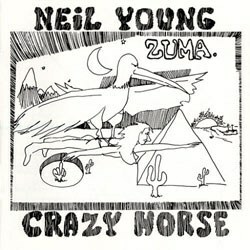 Neil Young did Zuma with Crazy Horse and the recordings, that took place in Malibu, lasted over a year. The album was finally released in November 1975. The most songs are produced by Neil Young and David Briggs while Young also produced three songs together with Tim Mulligan. In six of the nine songs, Neil plays with his old companions Crazy Horse. Danny Whitten, who died in 1972, has been replaced by Frank Sampredo on the rhythm guitar. On the last track on the album, “Through My Sails”, Neil is playing with his other companions Crosby, Stills and Nash. The drawing gives a feeling of reminiscence for an Eldorado of ancient time. The album title Zuma makes also this more believing as if it can be accredited to Montezuma that are mentioned in “Cortez the Killer”. Montezuma was a ruler of the Aztecs in the 1500 century. The lyrics in "Stupid Girl" might have something to do with Carrie Snodgress: Neil's and Carrie's relationship had recently crashed and plenty of bitterness could be found in the backwater. The album has some great rock songs like “Don’t Cry No Tears” and “Barstool Blues” in which the electric guitar is dominating the sound. Another impressing tune is "Cortez the Killer". The albums On the Beach and Tonight's the Night had divided the critics and had divided the critics and had been far from pleasing all the fans. Zuma, however, would satisfy both the critics and the fans to a high degree.